My apologies for not getting this up at the end of June, but there were so many things going on I didn’t have a chance to create a bingo board. So, this one is for August and September. Enjoy! and don’t forget to let me know how you’re coming along. It’s time for the Summer Tsundoku Bingo. 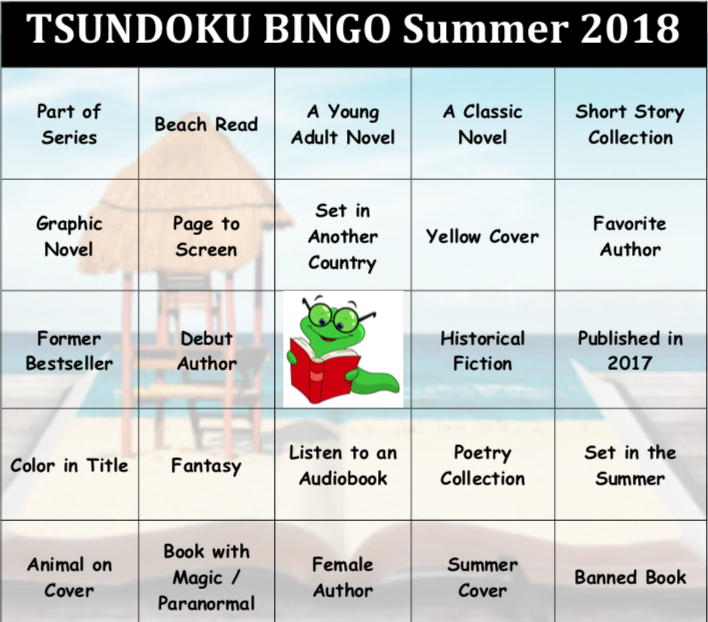 If you joined in for the Spring Tsundoku Bingo, I hope you had fun and were able to knock some of those books of your TBR pile. I would love to see what you’ve read and for what categories. Please feel free to share, so that I may add some more books to my reading list. You don’t need a blog to join in the reading fun. If you plan on doing the challenge just say so in the comments. ♦ You know how bingo works – get 5 across, horizontal, or diagonal or if you want just work your way through the board during the quarter. The FREE SPACE bookworm is your opportunity to choose any book you want to read. Saved! I’ll definitely try and do this! Do join in! 🙂 I’ve plotted my reading course and think I may have chosen my books well. I’ll be able to knock a few more off the TBR and tick a few off my reading challenges.